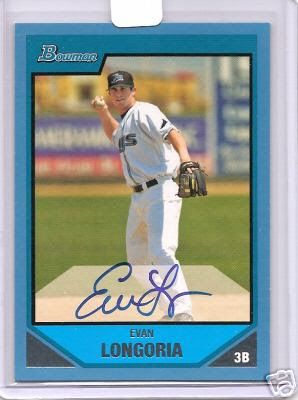 After only 6 Major League games the Tampa Bay Rays signed highly touted 3rd base prospect and former Long Beach Dirtbag Evan Longoria to a 6 year $17.5Mil contract that includes bonuses and extensions that can reach as high as $44.5Mil over 9 season. This guy has played in less than a weeks worth of real games and, yet, they felt confident enough to sign him to this sweetheart deal. I guess time will tell if this was a smart move, but considering the quality of their youngsters it might just be the right move. As some of you know, the Rays have been aggressively tying up their young players to long term deals. They include Carl Crawford, Rocco Baldelli, James Shields, Carlos Pena, and Dan Wheeler. Furthermore, they are in talks with the agents of Scott Kazmir and B.J. Upton. So, I think their future is looking bright. Now this news has got me thinking. Should the Dodgers do the same thing? Is there anybody on the Dodgers you would like to have signed up to a long term deal? How about any prospects that will be coming up soon or later this year? Of course we would like to see Russell Martin signed up, but, as we all know, the Dodgers were rebuffed by Martin's agent over the Winter. Right now James Loney and Andre Ethier come to mind as potential beneficiaries of a long term deal. Also, if we wanted to take a risk I would sign Matt Kemp to a contract. Should we consider something along these lines for Clayton Kershaw, or how about Andy LaRoche? Should Blake Dewitt be considered at this time? These are tough questions that has me thankful I'm not a GM. Here are some Dodger treasures recently found on eBay. I had seen a silk scarf like this years ago at a card show in the early 1990's. It was framed and matted in a nice display along with some autographs. I think they wanted a few hundred dollars for it then. The scarf dates from 1951 and has bright blue borders with a green infield frame. It measures approximately 32" square. There are drawings, done by famous sports cartoonist Willard Mullin, of the Brooklyn Bum, Ebbets Field, a map of the Brooklyn borough and a scoreboard. This particular scarf recently sold on eBay at a very reasonable price of $56.25. In fact, this was really a steal. I wish I had spotted this auction sooner. Here is a board game made in the late 50's to early 60's featuring the Los Angeles Dodgers. It comes with a game board, some disk and several deck of cards. Now, I'm not sure how the game is played, but it clearly has been well used. Or as my sister would say, "It has been well loved." I'm sure there are several "kid at heart" grown-ups out there who can let us all know about the game. A great feature to this game is that it includes head shots of several Dodger players along the edge of the board game box. I see Gill Hodges and Roger Craig. Anyone see anyone else? This game board did not sell in the eBay auction. In fact, I can't figure out why the seller placed such a high reserve price. It received a high bid of $89.59. I think that is more than generous for the item considering its condition. This past weekends series against the Braves was painful to watch. Our offense was anemic. They scored only 3 runs and had a total 17 hits over the three game set. When your runs are the result of pinch hit single by Juan Pierre and solo homeruns by slumping Andruw Jones and a slow starting Russell Martin, then you know things are not good in Dodgerville. Our pitching was subpar. Derek Lowe gave up 5 runs in just over 4 innings on Friday. This included 2 rocket-propelled homeruns by Chipper Jones. Chad Billinglsey was a little stronger on Saturday as he yielded only 4 runs in 5 innings of work. Unfortunately, that was more damage than the team could overcome. On Sunday the game was competitive- at least for most of the time. Hiroki Kuroda only gave up 2 runs in his 7 innings, but, again, it was too high a wall to climb for the Dodgers. They failed to score again after Martin's solo homerun. On top of that, Scott Proctor came into the game in relief in the 7th inning and was dinged for a total of 4 runs in less than 2 innings. The game was over and the Dodgers got swept for the first time this season. Just when I thought the Dodgers could get well playing some east coast teams they end up getting slapped silly. I hope Cincinnati will bring us out of our slump. It does not feel good to be in last place. Of special note: If Garciaparra's injury continues to hamper his play, then he needs to sit down. By all accounts his fielding gaffes have cost us quite a few runs.